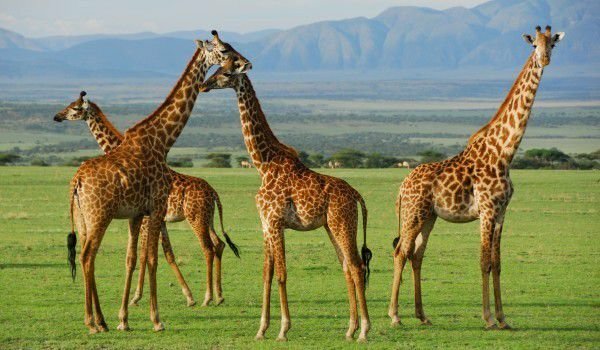 Ngorongoro Crater Reserve is located between the Serengeti National Park and the national park at Lake Maniara in northern Tanzania. Because of its incredible beauty and views of various wild animals, people often call it - the eighth wonder of the world. Scientists believe that Ngorongoro formed millions of years ago, after the extinction of volcanic activity here. It is believed that the size of the Ngorongoro was approximately that of Kilimanjaro. With the extinction of the volcano, however, a huge crater was formed. The volcano was extinct for around 250, 000 years, but erupted for the first time around 2.5 million years ago. This is the largest crater on Earth, which was formed as a result of volcanic action. Its diameter is 20 km. The crater walls rise steeply to a height 600 m from the bottom. Today, this valley is the only volcanic caldera in the world. Ngorongoro serves as a refuge for many rare African animals. Here are found 50 species of large mammals such as lions, elephants, rhinos, hippos and several antelopes. Besides them, the rolling plains hold African monkeys, baboons, pigs and spotted hyenas. The richness of bird species is huge - over 200 species, including ostriches, ducks and guinea fowl. One of the most stunning views that you can see here is the abundant population of flamingos that live along the lake Magadan (the lowest part of the volcanic crater). Their pink feathers in the background of the turquoise water of the lake is something not to forget. Each year after heavy rains from December to May the pastures of the emerald green crater are filled with pink, yellow, blue and white flowers of petunia, lupine, daisies and a rare blue clover. The rich volcanic soil allows the lives of these rare and beautiful species that have earned the title of most beautiful among the beautiful for the Reserve. Idyllic pictures of nature in this lush valley are complemented by numerous springs and streams and the Great Salt Lake with bright blue waters. When it gets very hot, it dries. Local population of Ngorongoro consists of the Massai. They support themselves mainly with livestock and on a regular basis can be seen how they transhumant small herds of cows, goats or sheep. Ngorongoro was declared a reserve in 1959, with the Special merit for a German researcher Bernhard Grzimek and his son Michael Grzimek. If you choose to embark on an exotic trip to this beautiful place, you should know that on the crown of the crater there are many houses and tent camps. From them, a perfect view of the lush valley is revealed.